The Medici series, released in August, 2017 honors an iconic and historic Florentine family. It's made in a unique material developed by Visconti called Acrosilk. The Medici was an Italian banking family, political dynasty and royal house reigning during the first half of the 15th century in Florence. Along with other powerful families of Italy, including the Visconti and Sforza of Milan, they inspired the birth of the Renaissance through their patronage of the arts. They commissioned artists for major works of art, including paintings, sculptures and architecture. The Medici patronage had a huge impact on the Renaissance, allowing artists to focus on their work without having to worry about money. A significant amount of art and architecture that was produced in Florence during the Renaissance was due to the Medici family. Early on, the Medici family supported the painter Masaccio and hired the architect Brunelleschi to rebuild the Basilica of San Lorenzo. Other famous artists that the Medici supported include Michelangelo, Raphael, Donatello, and Leonardo da Vinci. The Medici also supported science: the famous scientist Galileo worked as a tutor for the Medici children. Visconti has followed the Medici path as patron of arts and has drawn many ideas and collections from Florentine history. It was only a matter of time until Visconti would dedicate one of its collections to the Medici family. 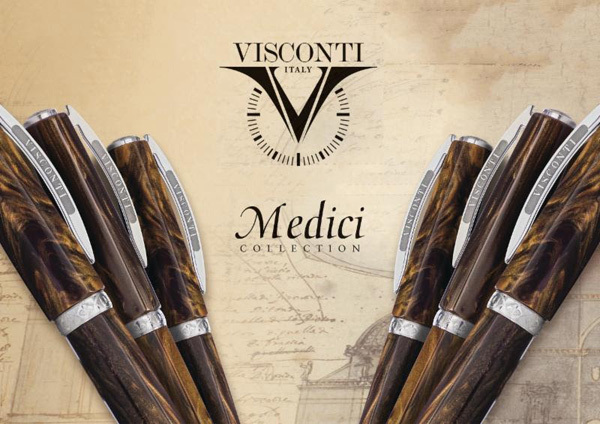 The Visconti Medici collection is crafted in a new material developed by Visconti called Acrosilk. Each pen has an eight sided faceted barrel, inspired by the baptistery of Florence. The shape is made following the rules of Divine Proportion, codified by Leonardo da Vinci under the patronage of the Medici family. Acrosilk is a compound of acrylic resin and silk fibers. The result is a fantastic glossy and luminescent wooden color, chosen as a tribute to the ancient luxury materials used in the princely Medici mansions. The ring is chiselled with a symbol of the Medici family, and all trims are Palladium plated. Medici is available in four models: over-sized fountain pen with Visconti's piston power filler, mid-sized fountain pen with cartridge or converter fill, rollerball, and ballpoint. Fountain pen and rollerball models feature Visconti's Hook Safe Lock cap attachment. Fountain pen nibs (available in EF, F, M, B or Stub) are made from 23kt Palladium. Visconti history starts in Italy, in the city of Florence, the Italian capital of art and culture. Florence is also one of the largest districts of the Italian fashion and luxury industry. 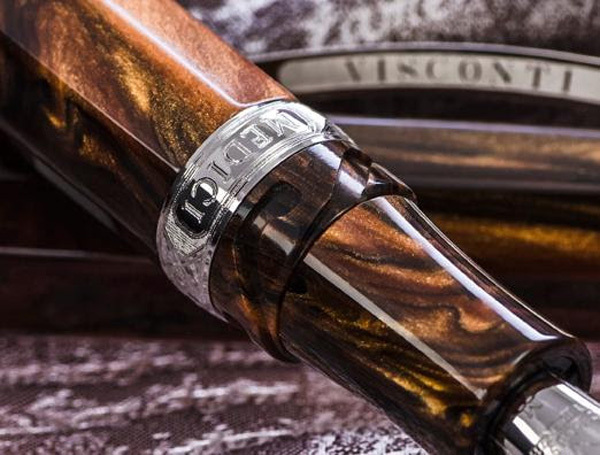 A lot of the inspiration for Visconti designs comes from the company's roots in Florence. The brand name "Vistonti" has come to be known for extraordinarily elegant writing instruments that are a product of intense historical and technological research. 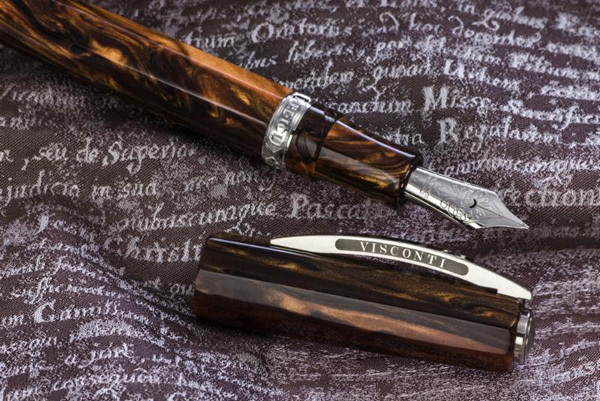 On one side, Visconti has preserved and rediscovered old world craftsmanship techniques in the production of writing instruments. On the other hand, Visconti continues to research new materials to produce innovative luxury pens, including Volcanic Lava, unidirectional carbon, acrosilk and cotto tile. In addition, Visconti has introduced many innovative technical solutions, such as their magnetic lock system, double filler, travelling ink-pot, Palladium 23kt nibs, which all make Visconti writing instruments even more special. Luxury writing instruments are not just defined by the price, but most of all by the uniqueness of the piece, the special manufacturing process, the craftsmanship skills used, the materials, and the finishing touches. Visconti has come to be known as a premier niche manufacturer of extraordinary writing instruments.